NEO - Tropical Environment Desarrollando ConCIENCIA: Why So Colourful? *This blog post was originally published in the “Sous la loupe” section of the Spring 2015 edition of Antennae, the Bulletin of the Entomological Society of Québec. Who hasn’t felt awestruck at the sight of a monarch butterfly (Danaus plexippus). That feeling is to be expected. As many other insects, the monarch is desperately trying to be seen: it relies on aposematism, a strategy meant to avoid being eaten. A bird will only make the mistake of eating a monarch once. This butterfly is filled with cardenolides, toxic compounds that are acquired during the larval stage as the caterpillar is feeding on milkweed (Asclepias sp.). After this disturbing experience, the disgusted bird will remember to avoid any butterfly sporting bright orange and black wings. Butterflies are not the only fans of this strategy. Aposematism can be found in other insects, such as ladybird beetles, but also among animals as different as poison dart frogs and opistobranchs (colourful marine slugs). Just like the monarch, many species acquire toxic compounds from their food. Other species produce these poisons themselves. And to advertise their toxicity to the world, colour is not the only medium! Many species advertise to predators that it is better to leave them alone through sounds or odours. Simply said, aposematism means telling predators, through a variety of signals, that an animal is well defended. 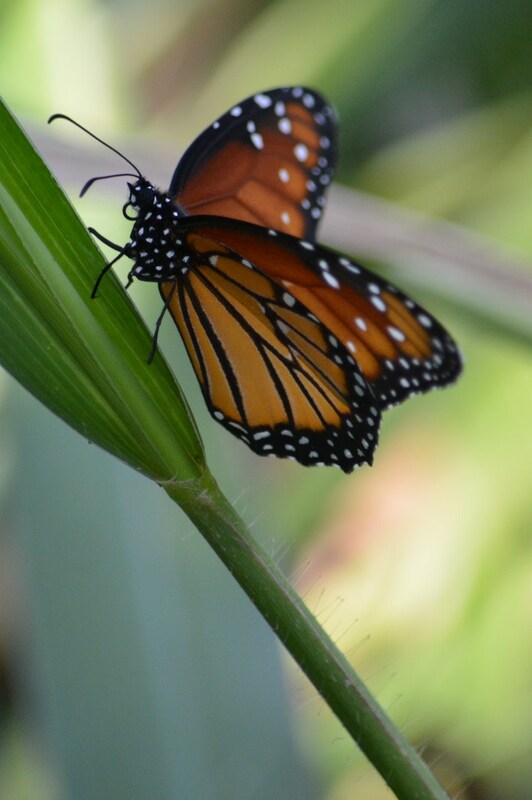 Danaus gilippus is a close relative of the monarch that can be found in tropical areas. Darién Province, Republic of Panamá (Photo: Nicolas Chatel-Launay). Aposematism is not a novel discovery. This strategy was first suggested as a mechanism born from evolution by Alfred Russel Wallace in 1866. Even if aposematism is easy to understand, many questions still arise among scientists about this strategy. For example, how did it evolve? Could a butterfly like the monarch have developed it gradually, becoming more orange with each generation? Alternatively, did it evolve through rapid mutation? A lot of research will be needed to answer these questions. Other researchers try to tease apart the role of sexual selection in aposematism. Does a colourful animal have more descendants because predators avoid it, or because sexual partners prefer colourful mates? Less well-known than the monarch, Eumaeus godartii (Lycaenidae) is another good example of aposematic butterfly. Chagres National Park, Republic of Panamá (Photo: Nicolas Chatel-Launay). Another interesting aspect of aposematism is the phenomenal amount of mimetic strategies that arise from it. In Québec, one can meet the viceroy (Limenitis archippus) that, just as the monarch, covers itself in orange and black. But the viceroy is not poisonous! Thanks to this deception, the colours of the monarch allow the viceroy to be avoided by birds. This type of mimetic behaviour is called “Batesian mimicry”. This form of mimicry is also common in many harmless snakes that copy the colourful patterns of extremely venomous coral snakes. A different situation is possible. What if many toxic species all look alike? If they do, all these species increase their chance of survival if a predator has learned to avoid the shared color pattern. All that is needed is for a predator to have had one bad experience with only one of the mimetic species for all to be protected. This type of mimicry is called “Müllerian mimicry”. 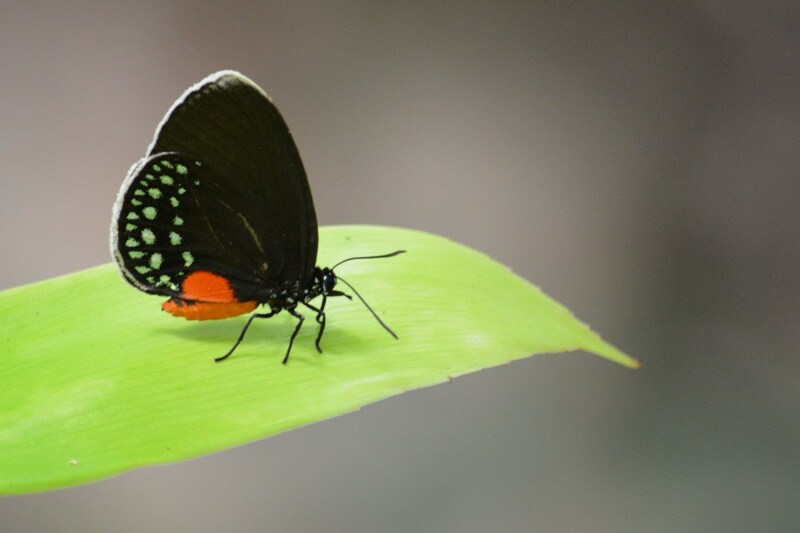 Butterflies of the Heliconius genus, found in Central and South America are among the best studied cases. These toxic butterflies have very variable wing patterns, even within a single species. Surprisingly, two different species captured in the same locality look more similar than they do specimens of their respective species collected from far away locations. This regional similarity creates an effective protection for all mimics in the area. Butterflies of the Heliconius genus and other closely related genera are an excellent example of Müllerian mimicry. Metropolitan Natural Park, Republic of Panamá (Photo: Nicolas Chatel-Launay). Many scientists are presently working on the mysteries still surrounding aposematism. Some use the latest genomic techniques, while others continue a long tradition of behavioural studies. After more than a century of research on this relatively simple strategy, there is still much to unravel and entomology remains a limitless field of study.